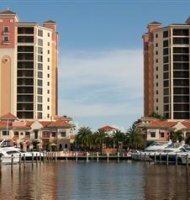 Cape Harbour is located in Southwest Cape Coral on Florida's Gulf coast. The southern gulf coast is home of beautiful white sand beaches and warm gulf waters. Cape Coral is a very unique city with over 400 miles of canals and waterfront homes. Cape Harbour is bordered by the natural mangrove buffer to the inter-coastal waterways and blue ways, which offer some the areas best fishing, boating and watersports. Cape Harbour offers residents the ultimate choice of lifestyle living. If you prefer condo style living, you can be in a high-rise condos of Marina South with spectacular views above the lively nightlife, in the mid-rise condos Marina View with relaxing marina views or in a coach home enjoying single family amenities. Not ready for a condo, choose from an amazing custom estate home with gulf access, lakefront home or a fabulous villa. Or live on the edge, literally, in a Funky Fish House right on the 76-slip deep-water marina. There is even a Boat House providing indoor boat storage for vessels up to 35ft and 18,000lbs, boat sales, service and ship store. You are only a short boat ride out to the inter-coastal waterways and the Gulf of Mexico. What ever lifestyle you choose, you will rarely have to leave your community. Cape Harbour offers multiple options for waterfront dining and the Promenade features boutique shopping and a Spa and Salon. Rumrunners is a waterfront restaurant with plenty of indoor and outdoor seating where you can enjoy great food and drinks while watching the boats heading out or returning home. Fathoms is a casual bar/restaurant located right along the marina in the base of Marina South featuring international cuisine with authentic flavors. The outdoor bar is the perfect spot to relax, enjoy the views and music, have a drink and contemplate why you did not move here sooner. Stop at the French Press for a morning coffee, Pignoli on the Harbour for lunch then back to the French Press for a gelato. Here are some of the newest listings in Cape Harbour. View all of the current real estate listings of condos for sale and homes for sale.